Scams and unfair billing practices represent several billion dollars lost by businesses and individuals each year in the United States alone. Most of the time people and businesses don’t even realize that they’re being taken advantage of. Computers and networks are everywhere you look. They require installation, configuration, maintenance, and repair. The room this leaves for abuse is tremendous. Controls and regulations to assist in safeguarding against these practices have, to this point, been ineffective. We must practice self-preservation to ward off some of these entities that would take advantage of us. "IT Scams & Unfair Billing Practices" presents examples of these exploits and what should be done. Being enlightened regarding these practices can prevent needless expenditures for both businesses and individuals. Due to reader request for this chapter in electronic format, we are offering this as a Mini E-Book. It is an excerpt from "The IT Handbook for Business". Note: If you own "The IT Handbook for Business" you do not need this unless you want to have it additionally on an electronic device. 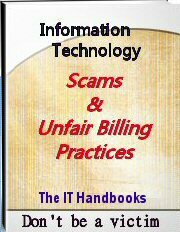 "IT Scams & Unfair Billing Practices" presents examples of these exploits and what should be done. Being enlightened regarding these practices can prevent needless expenditures for both businesses and individuals.